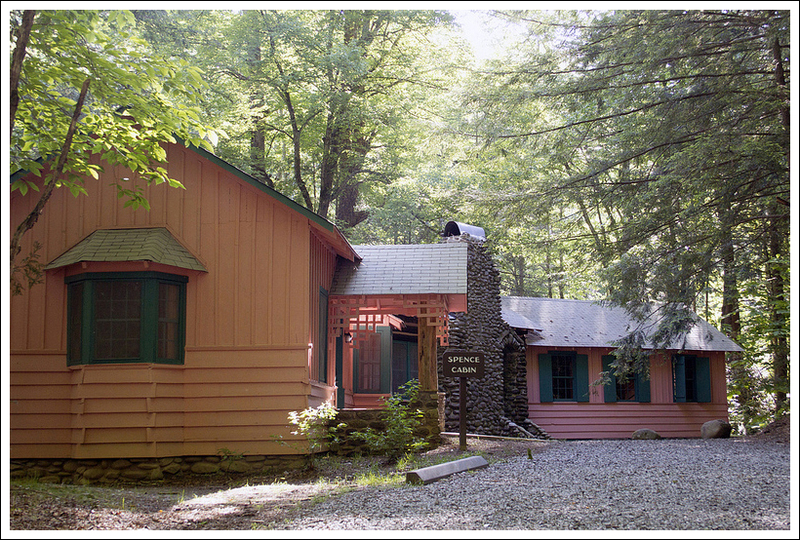 Cucumber Gap is a lovely 5.6 mile loop known for wildflowers, stream scenery and the historic Elkmont cabins. 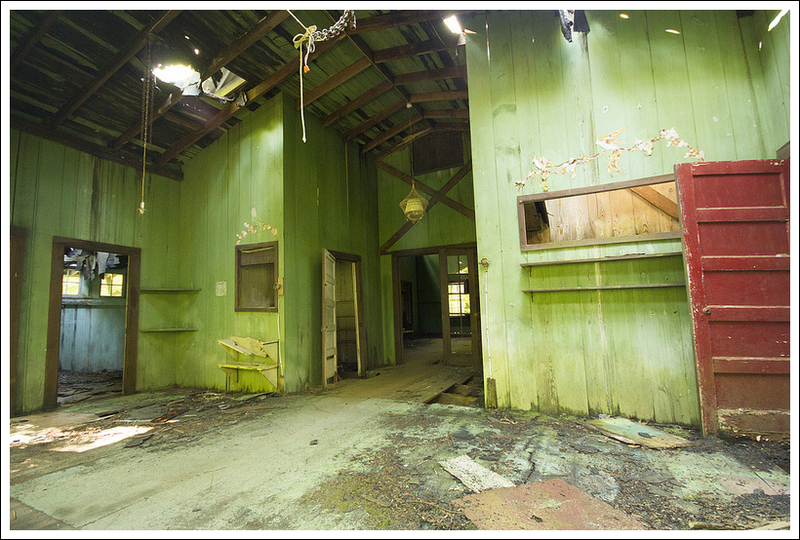 A peek inside one of the dilapidated Elkmont cabins. 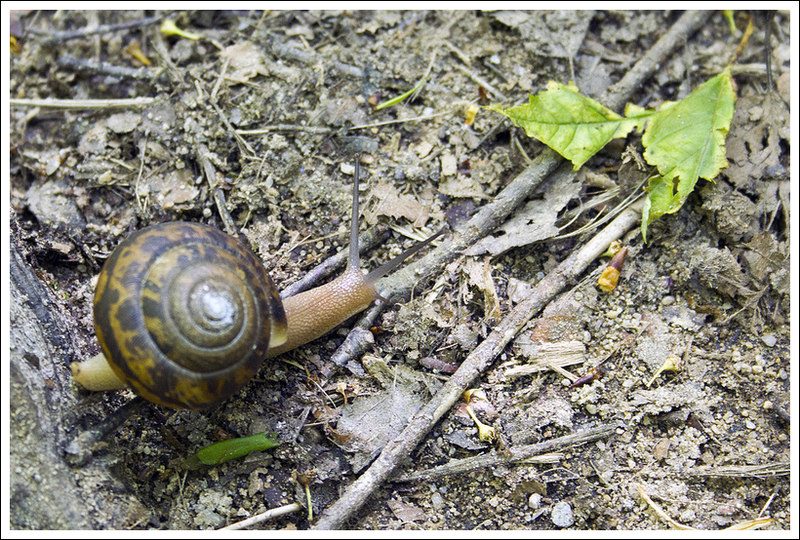 Below: Adam walks the Little River Trail; the Spence Cabin; We saw lots of big snails on the trail. 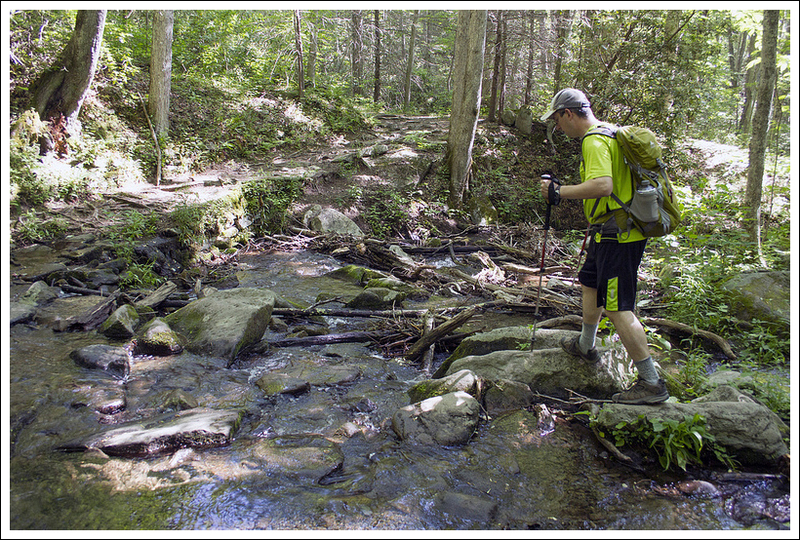 For our last day of hiking in the Smokies, we opted for something easy compared to our previous two days, which had us hiking over difficult terrain for 10+ miles each day. We decided a hike along a pretty stream with a taste of history would be a nice choice. The hike started on the Little River Trail. We crossed the gate that led to the gravel road. Almost immediately to the left, you come across some of the Elkmont cabins. There are signs posted asking that you not enter the houses. These do look dangerous, with caved-in roofs and rotting wood, so don’t risk it. The Little River Logging Company established this small town in 1908 to serve as a central location for its logging efforts. 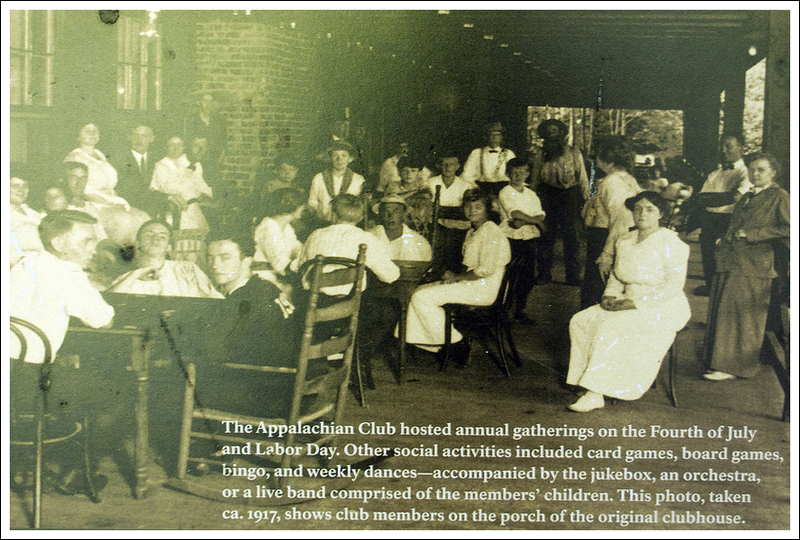 In 1910, they started selling parcels of land to interested outdoorsmen, who established the Appalachian Club. In 1912, the Wonderland Park Hotel was built and in 1919 a group of businessmen bought the hotel and established the Wonderland Club. As the wealthy began traveling to this area, the Appalachian Club and Wonderland Club served as social outlets for the elite. Most of these houses are in complete ruin, as the park has taken over the property after not renewing the leases of those previous owners. There is a plan to maintain and renovate 19 of these houses (mostly in the “Daisy Town” area). We continued along the trail that is flanked by the Little River to the left. There are many places that you can duck off the main trail and enjoy watching the flowing river. At 2.4 miles, you reach the junction with the Cucumber Gap Trail right after passing a bench. Take a right and head on the Cucumber Gap Trail, which begins an ascent. We came across a woman, who was glad to see us since she said we could “scare the bear away”. She had been walking on this trail many times and has seen bears frequently here. We were excited to possibly see a bear on the trail, but we weren’t lucky enough this time. Adam takes in the lovely Little River. Below: Huskey Branch Falls; Tall, lush trees on the hike. At 2.7 miles, you will rock-hop across Huskey Branch. The trail continues to ascend, but slightly more steeply until you reach the top of Cucumber Gap at mile 3.8. Off to the right, you may have an obstructed view of Burnt Mountain and the Bear Wallow Creek valley below. Near the top of the gap, you may see Fraser magnolias, often referred as “cucumber trees”, giving this trail its name. The trail descends at this point and crosses Tulip Branch at 4.4 miles. At 4.8 miles, the Cucumber Gap Trail ends and you willl take a right when you reach this junction with the Jakes Creek Trail. At 5.1 miles, the trail reaches another junction. Head right again at this fork. Soon, you will pass by more abandoned Elkmont houses until the trail opens up into the larger area of homes known as “Daisy Town”. Walking down the main street, you will reach the Appalachian Club, which has a large wooden porch and some historical signs that you can read to learn more about this area. From the club, make your way to the right and you should shortly reach your car again. This was a nice leg-stretcher of a hike, and one that you’ll likely want to take slowly to enjoy the scenery along the way. The houses are interesting to check out and you may want to take a few minutes to enjoy the heavy-flowing Little River. If you are someone that is interested in the history of this area right before the park was established, this is a great hike to check out. After two days of long, tough hikes, we began our final day in the Smokies looking for something a little more relaxing and low-key. While enjoying amazing (honestly… this is not an overstatement) donuts from The Donut Friar, we skimmed our guidebook. In the end, we settled on the Cucumber Gap Loop. 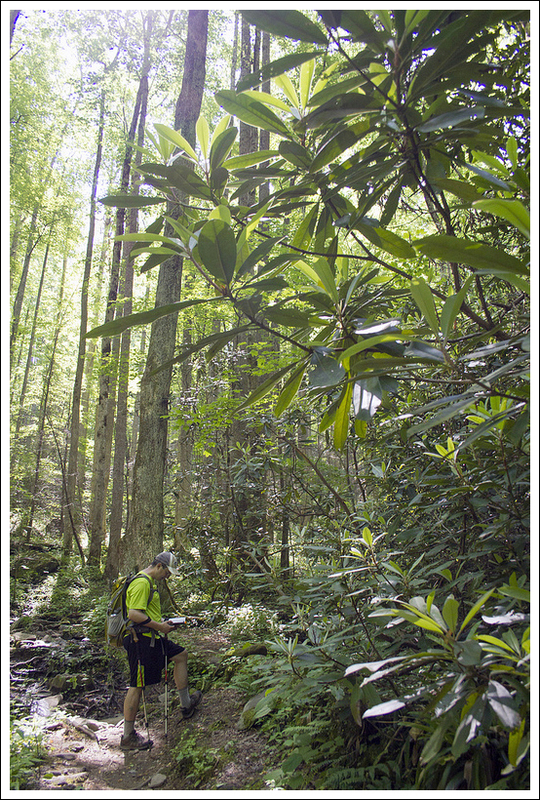 It’s known as one of the Smokies’ nicest, more moderate hikes. It boasts abundant wildflowers, beautiful river scenery and a chance to visit the historic Elkmont cottages. The trailhead is just a short drive from Gatlinburg, near the Elkmont campground. We set off on the Little River Trail, which is really more of a wide, gravel road than a trail. Almost immediately, the Spence Cabin came into view. This historic cabin has been restored by the park service, and is available for day-use special event rental. The other cabins dotting the river alongside the Spence Cabin haven’t been so lucky. 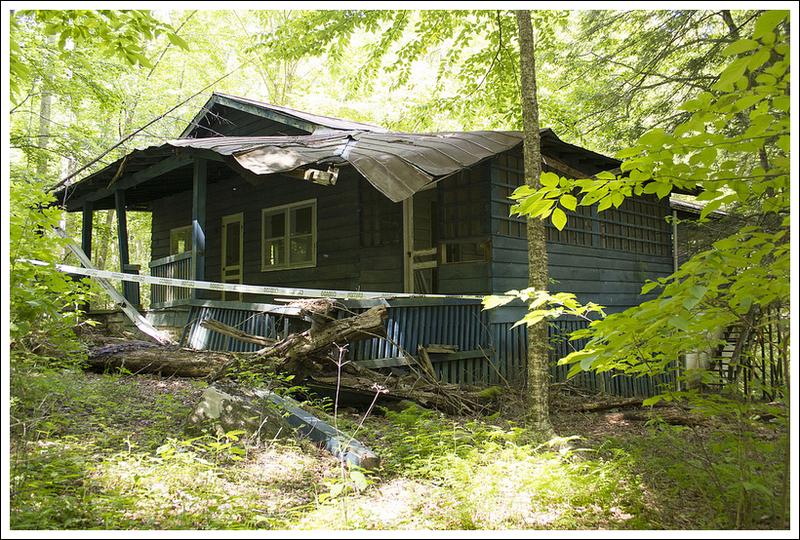 Most of them are dilapidated, sagging and fading back into the forest. ‘Keep Out’ signs are posted along the trail. Although you cannot enter (or even touch) the buildings, you can still peek through the windows and imagine what life may have been like in the area’s heyday. Christine does some rock hopping. 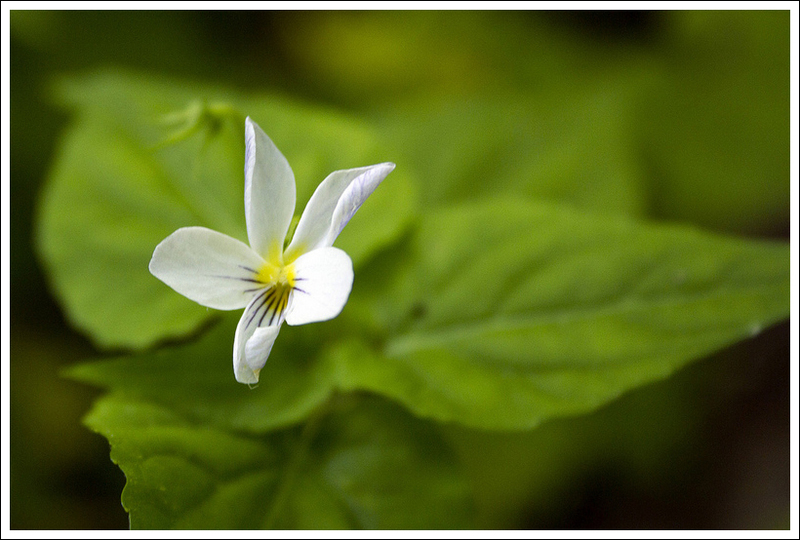 Below: Violets were abundant on the hike; Adam crosses Huskey Branch; Heading into ‘Daisy Town’. After spending a little time peering into the cottages, we continued along the path. I looked for wildflowers, but we really didn’t spot much beyond bluets, wild violets, sporadic mountain laurel and a few fading trilliums. It was several weeks past peak bloom in the park’s lower elevations. We stopped several times to enjoy and photograph the beautiful Little River. The water here tumbles over boulders and rock shelves, making many small cascades and rapids. The day was sunny and cloudless, so it was hard to take decent pictures. I did manage to find a few shady spots that were nice for photos. At one particular spot, I set up my tripod and sent Adam out to sit on a rock. He noticed a brown snake, sitting half in and half out of the water. I tried to get a photo, but as soon as I pointed my lens in his direction, the snake ducked into the water. It popped its head up one last time before diving deeper and disappearing for good. I did a little research on what kind of snake he might have been and came up with a common brown water snake. We soon passed a small waterfall entering from the right side of the trail. I didn’t see it mentioned in our guidebook, but apparently it’s called Huskey Branch Falls. It’s a pretty spot! 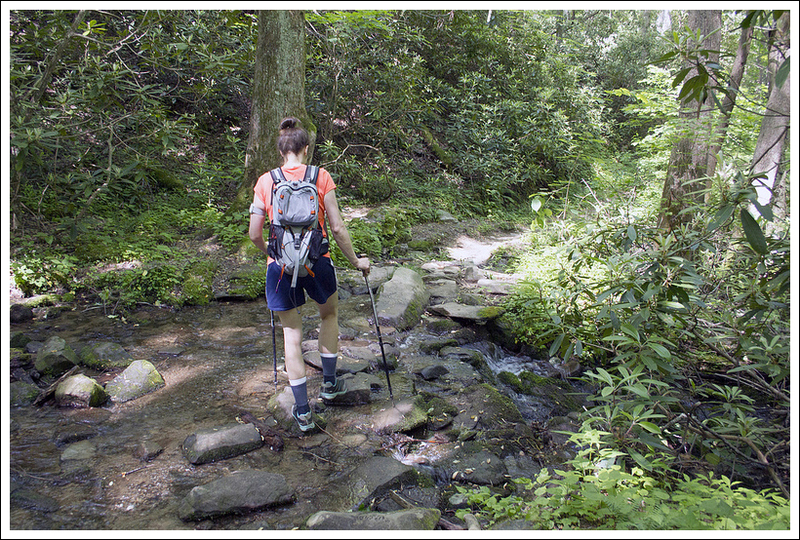 Shortly after the waterfall, we came to the junction with the Cucumber Gap Trail. Adam mentioned meeting the woman who passed along the bear warning. What I didn’t know at the time was that the only fatal bear attack in the Smokies happened close to this spot. I have a healthy respect for bears, but I’m not frightened of encountering them on the trail. Fatal encounters are rare and tragic. In the end, all we saw were lots of big snails, squirrels, and a couple pileated woodpeckers. The Cucumber Gap trail contains the steepest climbing of the hike. About half the elevation gain on this hike takes place over a single mile on this section of trail. There wasn’t anything remarkable or unique about this part of the hike – pretty violets, tall trees, and a couple shallow stream crossings. We also managed to pick up a bit of a breeze, which helped keep the bugs away. We soon found ourselves at a junction with a wide gravel road, we turned right and made our way to another junction with the Jakes Creek Trail. The remainder of the Elkmont cottages sit along this section of the hike. There are cabins in just about every rustic style imaginable. Apparently, Elkmont has been a controversial issue in the Smokies for years. Some people would like to see all of the buildings torn down, so that nature can take over. Others would like to see the homes restored so that the park’s origins and history can be visited and remembered. Currently, the plan lets each side of the argument win in a way. The Appalachian Club Porch has several nice rocking chairs. Below: Another Elkmont cottage; Historical information at the site; A bear on the drive back into town! Many of the cottages will be demolished and removed, but those that are in better condition or are historically significant will be repaired and eventually opened to the public. The area has already been added to the National Register of Historic Places. 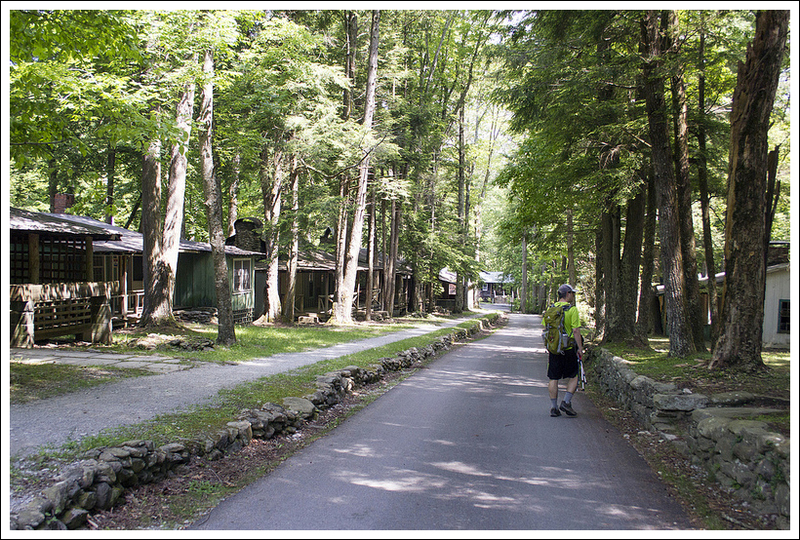 Near the end of the hike, we reached a paved road that passes through the densest section of Elkmont cottages. This area is definitely worth a little exploration! 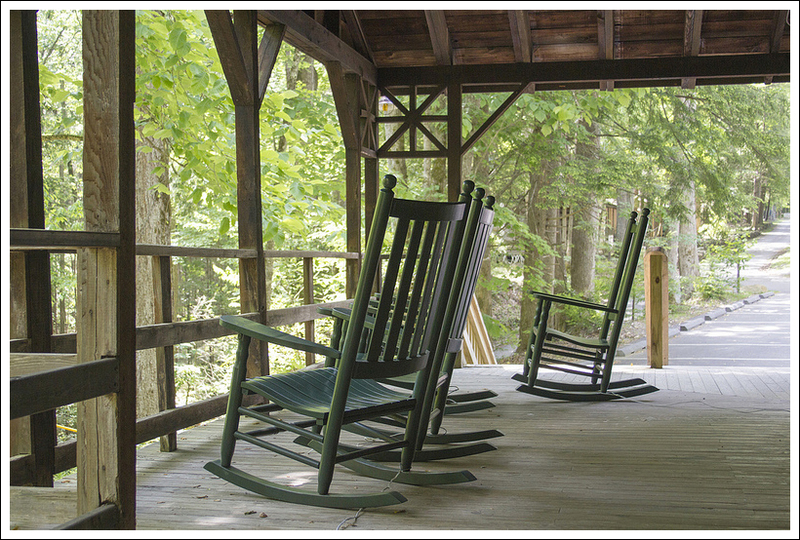 We enjoyed sitting on the chairs on the porch of the Appalachian Clubhouse. This building, like Spence Cabin, has already been restored and is available for event rental. The front of the building has a few signs with historical information and old photos. It sounds like it was quite the place to be back in the day! From the clubhouse, the return to our car was just a short walk along the road. While the Cucumber Gap Loop wasn’t the most thrilling hike of our trip, it was still fun and interesting. 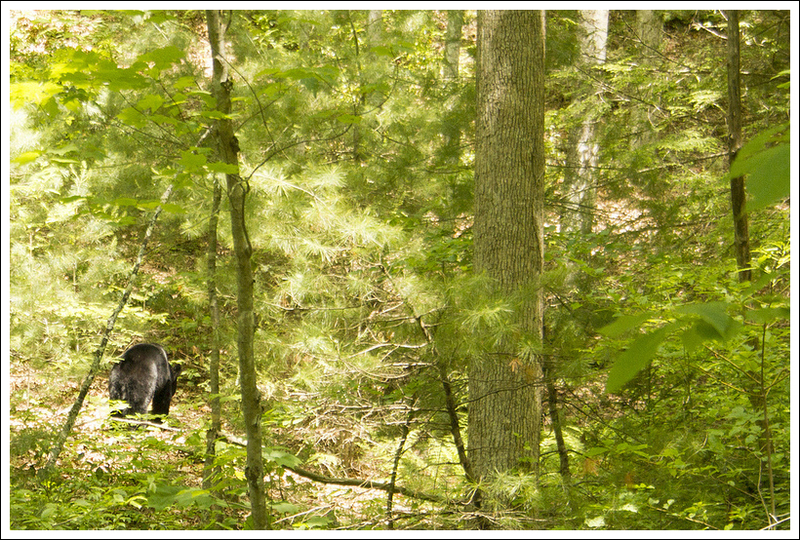 On our way back into Gatlinburg, Adam spotted a mother bear and two tiny cubs along the road. So, even though we didn’t see bears on the hike, we didn’t leave the Smokies without a great look at wildlife. It was a fitting final experience! Elevation Change – About 900 ft. Difficulty – 1.5. The trail along Little River is fairly flat. There is a little elevation on the Cucumber Gap trail, but it wasn’t too tough. Trail Conditions – 4. The Little River Trail and Jakes Creek Trail are both gravel fire roads that are very easy to walk on. 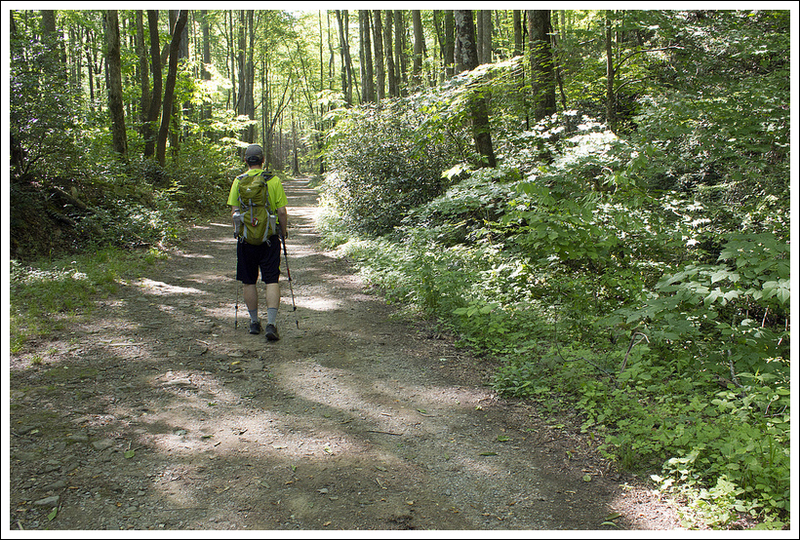 The Cucumber Gap trail was well-maintained, but somewhat overgrown in some areas. Views – 1. You may get an obstructed view of Burnt Mountain from the top of Cucumber Gap, but not much else. 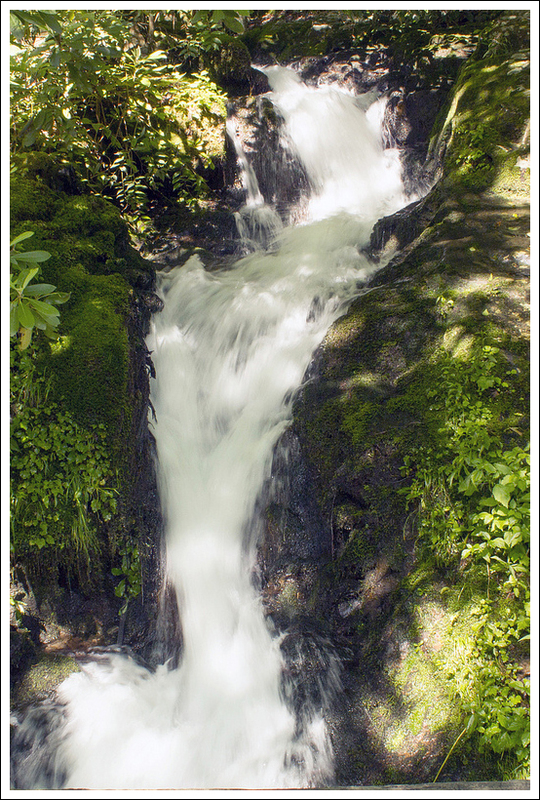 Streams/Waterfalls – 4. The Little River Trail has some of the best stream viewing you can see. There were some rapids, but no significant waterfalls. Wildlife – 3. A great spot for birding. Deer and bear have been spotted here often. Ease to Navigate – 3.5. There aren’t great signs around so that you know exactly how to get back to your car, but we were able to find it fairly easily (and now you should be able to as well). Solitude – 3. We saw a few people along the trail, but this is a little quieter than a lot of the popular trails in the park. Many people on the trail may be camping nearby. Directions to trailhead: From the edge of Gatlinburg, enter Great Smoky Mountains National Park and head south on US-441 South for 1.7 miles. Turn right on to Little River Road and go 4.9 miles. Take a left onto Elkmont Road and continue on it past the campground for a total of 2.0 miles. Park in the small parking lot and the Little River Trail is past the locked gate.